Food is often the center around many social gatherings or events that people attend for leisure or professional purposes. 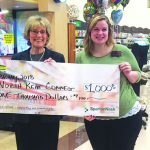 At North Kent Connect, a Rockford area nonprofit committed to improving the lives of all people in northern Kent County, individuals attend a similar event known as Senior Pantry, but for a different purpose. 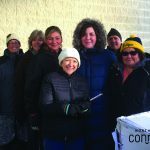 “Our Senior Pantry program provides food to local seniors who simply cannot afford to sustain their food needs throughout the month,” said Claire Guisfredi, Executive Director at North Kent Connect. 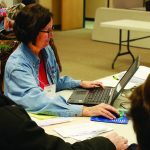 “We see a lot of the same faces and it is an honor to serve our seniors, knowing they can rely on a dependable resource for food every month,” said Guisfredi. For one program participant, Senior Pantry is more than just standing in line to claim a bag of food. Throughout the hours of the program, conversation and laughter fill the building, hugs are exchanged, and smiles paint the faces of people who battle food insecurity. “It’s really quite special that this program has cultivated a way for our seniors to build a sense of community, bond, and form long-term friendships,” said Guisfredi. 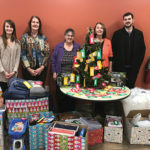 North Kent Connect (formerly North Kent Community Services), is a nonprofit organization that envisions a community of thriving people and connects people to the resources they need to move forward. Founded in 1973, North Kent Connect is committed to improving the lives of all people in northern Kent County by providing access to basic needs and promoting economic independence through its educational classes. NKC hosts several partner agencies including West Michigan Works!, Arbor Circle, and Mel Trotter Ministries. For more information on NKC, please visit www.nkconnect.org. Follow us on Facebook at North Kent Connect and on Twitter at @nkconnect.